The new user area allows you to see your bookings both on the web and on the app. We made some small improvements too. 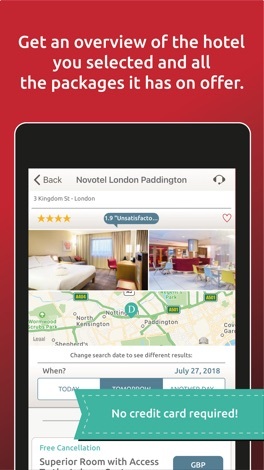 Book a few hours in a luxurious dayroom with the DayBreakHotels app! Use DayBreakHotels to experience a few hours of relaxation in your city. 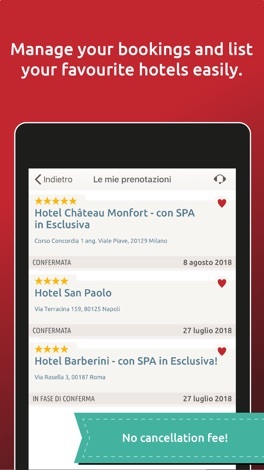 Discover different offers of over 3000 3 to 5 star hotels throughout Italy and abroad and book a dayroom for a few hours at half of the overnight price. Have a little vacation right in your city! Why download the app? Here are some more features! * The APP only collects data related to your position and to identify your device. Maximum confidentiality is guaranteed. London – The busy city takes its toll on you? Take a break in one of London’s most luxurious hotels in the heart of the city! Birmingham - Book a meeting room or a dayroom with business corner to meet business partners and work on projects. Edinburgh – Fancy treating yourself and relax in a day Spa before going to the Fringe? Find the best Spas on offer! The day-use formula allows you to book rooms and services in the best hotels for a few hours, paying only for the actual time you use the room. DayBreakHotels.com revolutionizes the traditional concept of hotels – these are not simply hotels by the hour! Day-use is a new way of experiencing hotels and luxury services during daytime. Organizing a romantic getaway for your partner has never been easier! 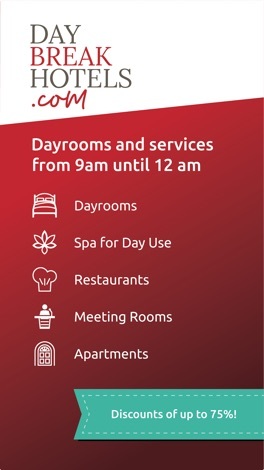 Book a room and choose the time you prefer, for example "Between 9 and 5". If you simply want to unwind for a few hours, find many different packages on DayBreakHotels.com offered 'By Hours', made for you to enjoy some well-deserved relaxation. 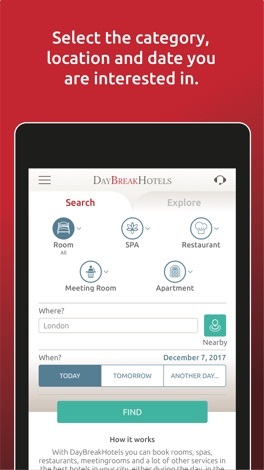 Booking a daybreak in a hotel on DayBreakHotels.com gives you a unique experience that doesn’t only contain a room for a day, but also services such as Spa access, meeting rooms, restaurants and swimming pools. You can enjoy rooms with terrace with an amazing view, a private jacuzzi, free wifi and many other small extra services such as appetizers, free parking or transfer to and from the airport or the station. - day use rooms to be awake after a long travel. Die VANSELLER Anwendung wurde für Mercedes-Benz Transporter Verkäuferinnen und Verkäufer der Mercedes-Benz Vertriebsorganisation entwickelt. Bitte beachten Sie, dass zur Nutzung der Applikation eine personenbezogene Authentifizierung erforderlich ist. Informationen zur Installation erhalten Sie bei der Ihnen kommunizierten Anwendungsbetreuung.